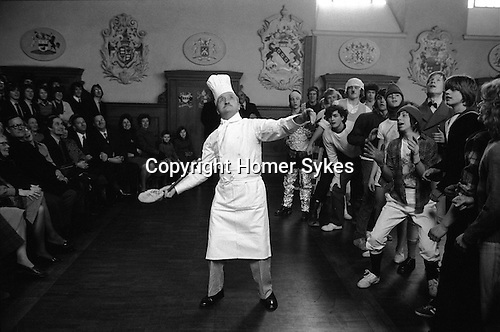 Westminster School annual Shrove Tuesday Pancake Greaze Westminster, London, England 1976. Head Chef Sam Sellars. tosses the pancake. Boys scramble for a piece of the pancake. It can be safely assumed that the Pancake Greaze at Westminster School has a long history although the first reference to it is in the works of the philosopher of Utilitarianism, Jeremy Bentham, a scholar there from 1755 to 1760. He wrote: 'The Higher School was divided from the Lower by a bar, and it was one of our pastimes to get the cook to throw a pancake over it.' Regrettably, he gives no further detail. In the nineteenth century, as in Bentham's time, the whole school of over two hundred pupils took part. Disapproval by the headmaster in 1883 led to a change whereby only one boy from each form was allowed to try for the pancake. from a specially-hired gorilla's outfit to the colours of a Chelsea football supporter. At the end of the ceremony, as is customary at all official functions, the dean 'begs a play', which the headmaster grants. This is a half-holiday for all the school, and nowadays is normally fitted into half-term break.